Growing perfect grass is all about site preparation. You cannot simply drop grass seed on your yard and expect a lush, vibrant lawn to grow. The seeds need direct contact with fertile soil to germinate. Spending some time to loosen the dirt and adding nutrients goes a long way in ensuring that a beautiful lawn develops. It's essential to plan the project when you know it's going to be dry; rain washes away grass seed. An expert at a local nursery or cooperative extension can also help you if you have questions during the project. Plant grass seed in the spring or summer to ensure that it has time to develop roots before the cold weather arrives. Choose a grass seed that grows well in your region, climate and sunlight availability. 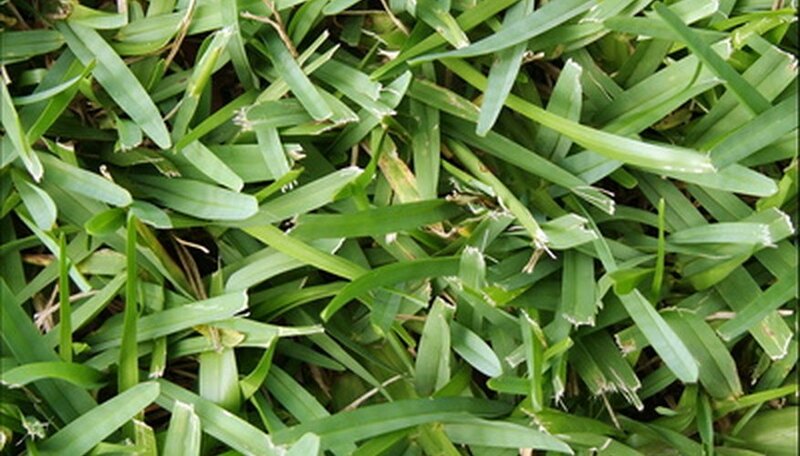 St. Augustine grass, for example, dies in freezing temperatures so it should only be planted in warm, coastal regions. See a local nursery for advice, or read the seed bag to determine the best growing conditions. Clear the planting area to create a good environment for grass seed. Get rid of debris like stones and weeds. Break up dirt clumps that are larger than one inch in diameter. Use an herbicide if there are a lot of weeds, but then wait a few weeks before planting seed because the chemicals may kill it. Loosen the top four to six inches of soil with a rototiller. Fill in low-lying spots with topsoil. Run a rake over the area until it's smooth. Add compost and sand to the dirt. These will improve the soil's drainage and give it nutrients. Lay down one inch of each substance, and mix it in with the local soil well. Spread a fertilizer high in phosphorus or a starter seed blend. Use the package to determine the rate to set the broadcast spreader. Spread grass seed with a mechanical or hand spreader. Take the size of the lawn into account when choosing a method. Cover the grass seed with 1/8 to 1/4 inch of soil to encourage faster germination. Water the grass seed often the first 10 days. Moisten the area twice a day for five to 10 minutes at a time. Once there are seedlings, cut back to watering 15 to 30 minutes daily. Mow the grass when the blades are three inches tall. Cut it 2 1/2 inches tall. Kill grassy weeds that emerge in the second year of growth. A pre-emergence herbicide will kill fescue, crabgrass and annual bluegrass. A post-emergence herbicide will eliminate perennnial weeds such as Bermuda grass and dallis grass. Spray the products, following the manufacturer's instructions, in the spring. Wear gloves as protection when planting grass seed. Avoid watering the new grass at night because this can invite fungal diseases. Do not walk on the grass until it becomes established.